A fascinating little thread in my life has been the colour of flowers those who give me flowers choose. As most of my readers know, my favourite rose is the blue rose. However, I can say that most of the time I am given flowers, as on this past day, those flowers have been yellow and flaming oranges roses. I think this is very interesting. Yellow is the symbol of friendship and orange represents fascination, desire and enthusiasm. I suppose I am an enthusiastic person and when I was teaching, one of the compliments give to me what that I was always enthusiastic about my subjects and passed that enthusiasm on to my students. Bright orange provides a daring statement of interest and passion. But, in my case, this passion is for and in the Lord. Babies' Breath always reminds me of my sister in heaven, because my mother planted that sweet flower when Beth Ann died. She was one. All of these things are part of memory and understanding. We are called to God in our memory and understanding. May God bless the bearers of this striking bouquet. May I always thank God when I think of you. Doctors who are real Catholics will say no to this, of course, as in British Columbia many years ago,when that Canadian province passed legislation making all doctors do abortions. Literally hundreds went to the States for freedom of conscience reasons. Ireland may end up with no Catholic hospitals and no Catholic doctors in those hospitals. And, what about medical students? Will they be forced to learn how to do abortions, as in some med schools in America? I know one who will not comply to that, but only one. One of the curious questions which always comes up when one is discussing or in a class on Dante's Divine Comedy is why Dante reacts to certain sinners with awe and respect. The examples are too many for this posting, but one sees the character of Dante changing as he moves through hell. Yet, one is puzzled by his honouring of some of the gross sinners who are forever damned. Now, one can say that there is nobility is all people, and even though that nobility is ruined by sin, one could stand back and admire a person for their former greatness. However, I think the problem is in the character of Dante, a personification of the author, but also fictionalized, as the poem is allegorical. The living Dante walks through hell and can respond to those in eternal punishment in several ways. But, it is Dante's own sin, his own imperfections, which cause him to pity were one should not do so. And, this thought leads me to another, which is that some of those in hell in the poem take pride in the very sins which sent them to horrible separation from God. I see this in others around me. There is a perverse pleasure taken when people share their sins, as if bragging about weaknesses in order either to make excuses for sin, or to invoke pity, or to simply gloat, is acceptable. Those Christians who have come to know salvation through Christ's Passion and Death, remain ashamed of those sins, and those very sins aid one in coming to a real humility. Humility, being self-knowledge, the knowledge of one's sins, brings one to the honest appraisal of who one is before God. But, to share those sins does not necessarily bring glory to God, or bring others to a desire for Christ's love. 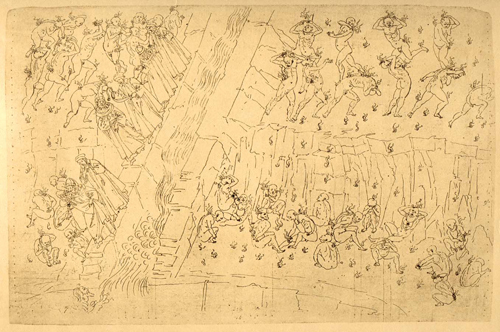 Dante's own imperfections, which gradually are purified through his journey through hell, purgatory and heaven, present the reader with a clear understanding of the scandal of sin. He reacts sometimes in pity, empathy, and horror, depending on the situation. 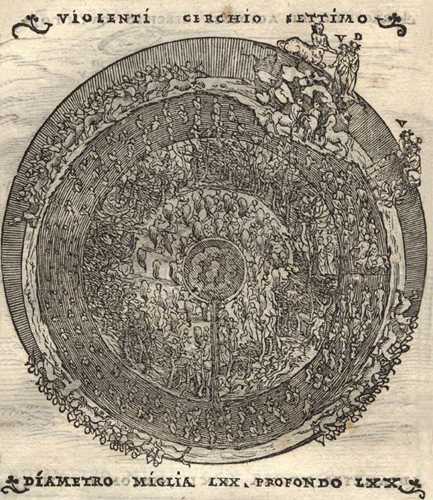 It is interesting that newer critics deny that Dante's descent into the seventh circle includes meeting homosexuals, a revision which is most deceitful. In that circle are the blasphemers and the usurers, as well, those who have sinned against God directly, which is why the homosexuals are not in the lesser punishment of the lustful. Those who sin against God directly, that is against natural law and the transcendence of God, are doomed to dance in one place on the hot sands forever, in the circle designated for the Violent. Violence against God and against nature cause this incessant movement, as the sodomites were seen as having a disturbed, constantly moving, unsteady, and unstable existence. Dante honours a poet he meets there, by lowering his head in respect,as he admired and copied this poet in life. But, the soul reaches out to him, as if to ask for acceptance. That type of empathy is no longer possible for those condemned to hell. Sadly, I have noticed more and more people desiring acceptance in their sins. Those who identify with their sins want those who believe in objective truth to blur the distinctions between sin and personhood. Such is the desire of those caught up in the gay lifestyle. Acceptance of sin is a type of consent, and those who brag of their sins have lost not only the sense of sin, but the sense of shame. In fact, another sin is added, which is that of rationalization. A man bragging to me about how much he drinks on the weekend is rationalizing his sins of intemperance and drunkeness. Bravado can be a form of deceit, rationalizing a weakness. Lying is another name for this type of rationalizing. In a landslide movement of false tolerance of sin, almost every country of the West is or will be accepting homosexual relations, as well as cohabitation of heterosexuals without marriage, as normal and even as a good. Sin is added to sin in pretending that an evil is a good. This has led more and more to people discussing their sins in public and encouraging others to do so. What is evil has been accepted by many, even some Catholics, as a good. So too, are those who are living in heterosexual, non-married relationships talking about their lives as if nothing was really wrong. What merely a few decades ago was unmentionable is now part of bragging and pride. To take pride in sinful behaviour must be one of the worst sins of all-the complete inversion of truth. I caution Catholics to not discuss sin, either their own or others, of course, as this glorifies the Evil One. And, discussing specific sins adds to the degradation of human dignity. If one is trying to help a person out of sin, and that person needs advice, that may be done privately in love and in great humility. But, if one is merely touting personal sins as an excuse for behaviour, or as an example of wilful confusion or loss, one is simply falling into pride. The popular songs of Mexico provide examples of the glorifying of sin, but even here, in Ireland and across the sea in England, a growing tendency to publicize one's sins is gaining acceptance and even a prurient popularity. If you are engaged in conversations with someone who keeps bringing up their sins, stop them and encourage them to go to Confession. If the sin is a lifestyle, help that person truly convert. To emphasize the sin over grace is just plain self-deceit, as grace is always stronger than sin. Do not enable sinners to continue in their sinful lifestyles. One more example may help in understanding the problem. Someone was telling me how much they were in debt on credit cards. They were bragging about all the things they have, and the things they do with credit. I could not help them understand that this debt was sinful, and that their carelessness and lack of good stewardship was not something about which to speak in a cavalier fashion. I stop discussing such things with people if they are not willing to listen. Continual discussion encourages rationalization. I have said to people. "Stop, I do not want to hear any more of this. You know what you need to do." One cannot go on year after year discussing sin. Conversion is always possible as grace is freely given to all. Part of the problem is that the Millenials, and even the Gen-Xers, lack boundaries. Do we really need to know everything about a person? Decorum and appropriateness in speech have disappeared. Support Life Site News, please. I miss being in Tyburn, but it is not my vocation. I know this now after months of thinking and praying, and failing to make the grade. 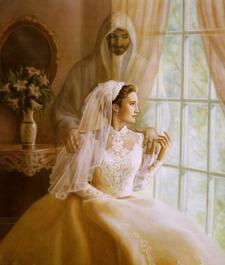 However, as Mother General said to me, we are ALL called to be Brides of the Bridegroom. All. The most wonderful thing to experience those days, weeks, and months I was in, altogether, was being surrounded by women who loved Our Lord before all else. How wonderful to be surrounded by Brides. Cannot the laity come to this type of focused love, where everything we do, or think, or say, or not say, is done for love of the Bridegroom? Is it possible to find laity who are as in love with Christ as the dear nuns? I meet many people who have many loves, but few who have One Love. And, from that One Love, all other loves can flow. What holds the lay person back? Fear? Time? Focus? I do not know, because if one knows Christ, one will seek Him and His Love before all else. But, I am following the advice of St. Catherine of Siena, which I have put on this blog before. I am building the little cell in my mind from which I shall never flee. Here is a posting with many, not all, of the articles on St. Catherine of Siena. Remember, she was a lay person. God desires the smallest degree of purity of conscience in you more than all the works you can perform.